I don’t get it. Maybe I’m wrong, or maybe my football knowledge isn’t what I thought it was, but I can’t understand the constant negativity toward Marcus Mariota and his transition to the NFL. Last night I read something on Twitter so shocking to me I had to do a double take. NFL Media analyst, Daniel Jeremiah, said, “Look, just off the pro day — forget the tape — Sean Mannion threw the ball much better than Marcus Mariota did.” Okay, it’s understandable that Mannion might be the better “pro-style” quarterback when compared to Mariota, but that’s where the comparisons seem to end. Mariota is far more athletic, a better decision maker, and a better winner than the quarterback in the orange and black. Just look at the numbers: Mannion 13,600 yards, 83 touchdowns, 54 interceptions and a record of 24-27 as a starter over four years. Mariota on the other hand, 10,796 yards, 105 touchdowns, 12 interceptions and a record of 36-5 as a starter, in only three years. How can you forget the tape? Real game action is what matters, not a pro day. From the NFL Network analyst above, to ESPN’s Skip Bayless saying he wouldn’t take Mariota in the first round, the hate is coming from all over. Call me biased, but I watched every single game in which Mariota has ever played and this guy is legit. He didn’t take snaps under center in college, so of course he won’t be able to do that in the NFL right? Wrong. 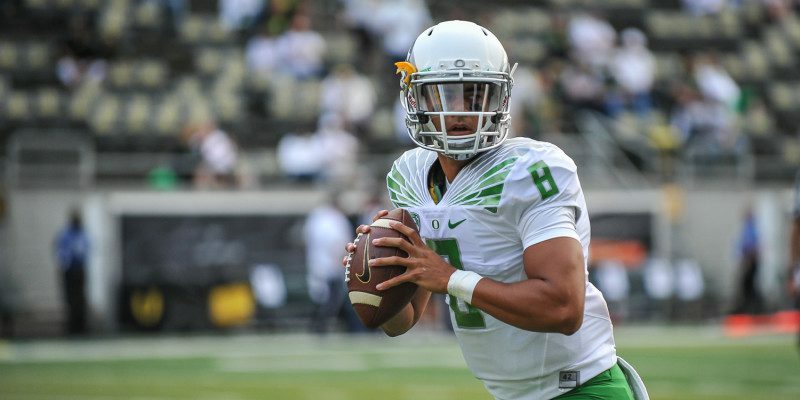 Mariota improved every year at Oregon and went from unknown three-star quarterback from Hawaii to Heisman winner. If that doesn’t show how hard he works, then I don’t know what does. Football is about to be Mariota’s only focus; so give him countless reps under center and let him study an NFL playbook, he’ll figure it out and surprise you along the way. Honestly, I believe that many of these analysts haven’t seen enough of Mariota to be confident in his ability to play at the next level. The Ducks play their games late at night on the west coast and Oregon runs the spread offense. Not good news for Mariota and his exposure. But for Mariota, his success is going to be in his hands once his name is called on draft day, April 30. There is a lot of love for Mariota in this article, but he deserves it. He stepped onto the Oregon campus and rewrote the record books, took the program to new heights, graduated in three years, and smiled and showed his remarkable character along the way. Mariota will be missed, but Duck fans nation wide will soon get to root for him in the NFL. Grab your seat on the Mariota bandwagon now; it’ll be full soon.